This is our first year growing turnips. The fresh leafy stalks are delicious and the tubers have a unique spicy taste that reminds me of my mom's garden when I was a kid. I would call them a good addition to any garden, especially when you factor in how easy they are to store for the winter. 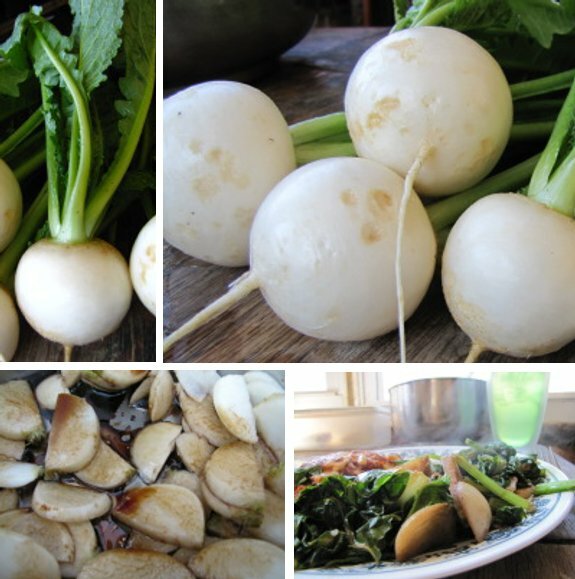 Don't eat the turnips, eat the greens all winter long. Are these Hakuri Turnips? They are one of my favorite things to eat. I love them with other root veggies under a roasted chicken. Did you just stir fry those turnips? No follow up in the oven? I've never fixed them that way. I always stay the tried and true Southern way of boiling them to death. I picked some this morning that I am going to experiment with for dinner. I'm thinking of putting some more seed in the ground and see if I can get them to grow through the winter. We had our first hard freeze last night, so all of the greens are hitting their prime. Daddy --- Excellent suggestion! Mark actually told me he preferred the greens to the tubers, and so did I. So we'll probably follow your lead! Dave --- It said Hakurei on the package, but I'm sure that's the same thing. I tried them because Eliot Coleman had written about them and they sounded interesting. I tend to agree with you that a mixture of root vegetables under a roast chicken is the best way to eat roots. Jeremy --- Yeah, I sauteed them in some oil and balsamic vinegar, tubers for a few minutes, then added the greens on top. They were good, but I think the balsamic vinegar (which I usually use on greens) was a bit overkill with the tubers. I think next time I'd experiment with just sauteing them in oil. We're not big fans of any of the boiling them to death recipes despite me being raised in the South, so we always have to find other ways to cook things.